We finish our discussion with Robert Lance Snyder in advance of the release of his new book, John le Carré’s Post-Cold War Fiction. Jeff Quest: I’ve been working on a list of books recommended by le Carré and as a result reading many of the introductions he has written for other authors. More than any other type of book, he has written praise for books that are raising important human-rights issues. Reading the book description, it sounds as though you talk in greater depth about how le Carré’s views on social justice have impacted his later writing. Could you talk briefly about some of what you discovered during your analysis of his later work? Robert Lance Snyder: Perhaps what I’ve already said above answers your question, but I agree that le Carré’s acknowledgments of indebtedness to Michela Wrong’s In the Footsteps of Mr. Kurtz: Living on the Brink of Disaster in Mobutu’s Congo (2001) at the end of The Mission Song (2006) and to Carne Ross, author of Independent Diplomat: Dispatches from an Unaccountable Elite (2007), at the end of A Delicate Truth indicate his wide-ranging interest in human-rights issues. Other influences can be ferreted out from le Carré’s recent memoir titled The Pigeon Tunnel: Stories from My Life (2016). JQ: That answers my question of whether you have read the recent le Carré biography and autobiography. I know a lot of eyebrows were raised when The Pigeon Tunnel was announced right after the release of John le Carré: The Biography by Adam Sisman. I just read le Carré’s introduction to Don McCullin’s Hearts of Darkness, and I think it cuts to the heart of why we got The Pigeon Tunnel more than the reasons le Carré gave. “I wanted to know his verdict. Yes, he had read my piece [. . .]. No, no, he liked it. No, he really did. He just hoped people wouldn’t think he lacked a sense of humour. This really threw me, but for completeness’ sake I’ll try. Yes, indeed: Don McCullin has a sense of humour. It comes as a bubbly, confiding laugh, dispelling introspection, half way to self-parody. Did these two new books reveal anything that had an impact on your analysis of his later work? RLS: To my chagrin I’m wholly unfamiliar with le Carré’s introduction to McCullin’s book. That fact admitted, I’ll take a stab at answering your framing inquiry. Adam Sisman’s biography, which I read after completing my book in mid-2015, explained why le Carré abandoned his manuscript-in-progress of a twenty-fourth novel, one allegedly tied intertextually to Conrad’s “The Secret Sharer.” Why le Carré made that decision, opting instead to release The Pigeon Tunnel, I can only surmise, but my hunch is that by age eighty-five his life had come full circle and that he was settling various outstanding accounts. So probably will we all do in our twilight years. JQ: We’re corresponding just a few days after Intelligence Squared held a debate to determine the better writer, Ian Fleming or le Carré. I know you’ve written previously in The Art of Indirection that Fleming’s James Bond character has been a large part of what has diminished any critical discussion of the espionage novel. Can you talk a bit more about your opinion of Fleming’s writing and its effect on spy fiction as a whole? To add to that, there have been a flurry of adaptations of le Carré’s post-Cold War work in the past two years with A Most Wanted Man, Our Kind of Traitor, and The Night Manager all appearing on the screen. Given that the film adaptations of Bond seem to have further reduced respect for Fleming’s writing, any guess as to what effect a multitude of le Carré adaptations will have on the opinion of his novels? RLS: The few novels by Fleming that I’ve read were too campy for my taste. Not that there’s anything inherently wrong with kitsch, but I have a limited appreciation for work that lends itself so readily to parody. Admittedly an inescapable exposure to the early Bond films probably jaundiced my sense of the texts on which they were based. (On the other hand, the outstanding Skyfall  did much to redeem the cinematic treatment of Agent 007.) In the end I don’t think that Fleming’s writing itself has had a significant impact on other espionage novelists, except perhaps to provide them with an arsenal of usually sardonic allusions. In response to your other question, the finesse of Anton Corbijn’s adaptation of A Most Wanted Man (2014) and Susanna White’s of Our Kind of Traitor (2016) can only enhance further the popular opinion of his novels. As his book sales have revealed for some time, though, his stock has been consistently high. JQ: I’d like to shift to looking at the current state of espionage fiction. The spy genre continues to work along a similar vein—one protagonist alone chasing down a problem. Both the “Superspy” and “Spymaster” type of novel still tend to follow that pattern whether “literary” or not. From my reading on the reality of espionage, that’s only part of spying. There’s a whole other aspect of espionage involving analysis and working as a team directing agents in the field. Arguably, more of spying is done at a computer screen now than in the field. In particular I’m thinking of some recent authors mining what to me is new ground for spy novels with team-based stories such as Mick Herron’s Slough House series and Susan Hasler’s Intelligence. Do you see any trends or shifts in the way spy stories are being told? Are there any authors writing now who are taking the espionage novel in new directions? RLS: I freely confess to being totally out of my depth in terms of this provocative question. For the last two years I have been so focused on unraveling the pattern of le Carré’s ten post-Cold War novels that I haven’t scouted new fiction by authors such as those you mention. Think of that limitation, then, as resulting from the fixation of a scholar intent on pursuing his chosen task. JQ: Putting on my collector hat, I see that you are using for your book’s cover image the great etching of le Carré by Stephen Alcorn that was used by Oak Tree Press in its limited edition of The Spy Who Came In from the Cold. Was that something you suggested or was that your publisher? 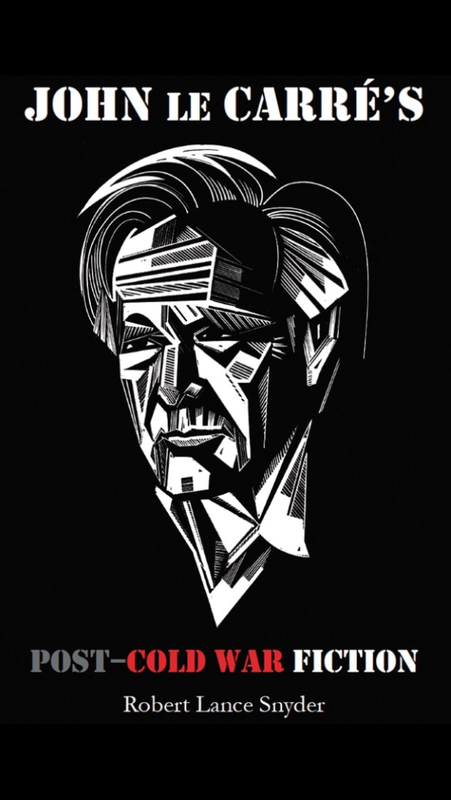 RLS: I was wholly unaware that artist Stephen Alcorn’s relief-block image of le Carré had graced an earlier le Carré edition when I asked his permission to use the portrait on my book’s cover. Stephen was incredibly gracious and accommodating in granting that request. Clearly impressed by the artistry of that depiction, the University of Missouri Press as my publisher featured it on the cover of their Fall/Winter 2016 catalog. I am greatly indebted to Professor Alcorn, who teaches art at Virginia Commonwealth University, for so kind a favor. JQ: I’ve been interrogating you for a while now, and I want to thank you as well as give you the opportunity to mention anything that we might not have discussed. Any last takeaways from your scholarly look at the later works of le Carré? RLS: I have enjoyed our exchange tremendously, and I’m grateful to you for making it possible. The only thing I would add is that at his best le Carré figures as one of those rare writers who makes us reflect on the boundary between “popular” and “serious” literature. Such at least is my conviction, and I’m sticking to it. Thanks again to Dr. Snyder for taking the time to talk about spy fiction and his upcoming book. Purchase the book directly from the publisher here or via Amazon. This book challenges distinctions between “popular” and “serious” literature by recognizing le Carré as one of the most significant ethicists in contemporary fiction, contributing to an overdue reassessment of his literary stature. Le Carré’s ten post–Cold War novels constitute a distinctive subset of his espionage fiction in their response to the momentous changes in geopolitics that began in the 1990s. Through a close reading of these novels, Snyder traces how—amid the “War on Terror” and transnationalism—le Carré weighes what is at stake in this conflict of deeply invested ideologies. Robert Lance Snyder is Professor Emeritus of English at the University of West Georgia. He is the author of The Art of Indirection in British Espionage Fiction and editor of two other books. He lives in Carrollton, GA.